That's how one reader, Gillian Price, summed it up in an email to me following our coverage of the sad news that Tait's Bakery had closed. Amazing, but not entirely unanticipated, since that's the way small communities work. It became the one place (every town has at least one of them) where the community came together to chat. Tait's was a different place altogether: A place to stay and linger and talk about things that, often, only fellow Brockvillians could understand. In some ways it was a time-warp. You walked into the same place where your parents and grandparents got their morning fix. 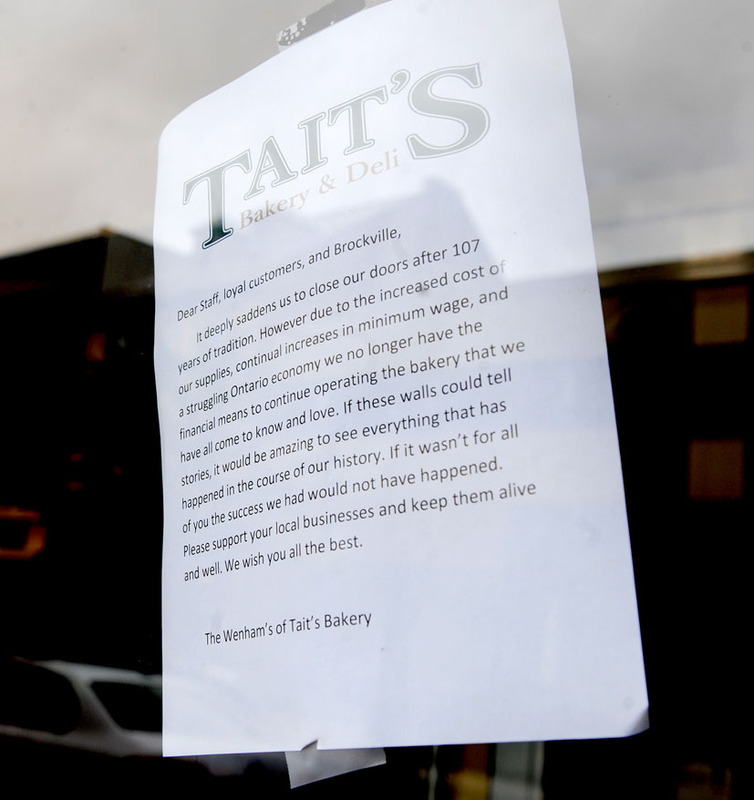 And now, a glimmer of hope: Some of those people who do not want a Brockville without a Tait's seem at least interested in talking about a reopening. One such individual was the author of a second email I received about our Tait's coverage. If Tait's was that important, it follows that some people would be interested in taking it over. I am not one to suggest we get our hopes up, since Brockville's hopes have been dashed so often in the past on the economic development front. Still, this one strikes me as a project that has some prospect of success. The scale of such a business would be far smaller than an industrial investment, for instance, and whoever did step in would have a ready and willing clientele. Two things would be necessary. First, whoever were to reopen Tait's would have not only to keep the name, but also the recipes and formulae, whatever it was that made Tait's bread and other products distinctive. Second, it would need that clientele to remain loyal. A Bring Back Tait's campaign (I'm thinking of you, DBIA people) might sustain that interest over the long months needed for a rebirth to happen. And while we are on the subject of such a campaign, I would suggest the following. One might quibble with that, of course, because the outpouring of support for Tait's suggests it never lacked people willing to drop by that one particular downtown business. However, expanding this hypothetical Bring Back Tait's campaign into a Shop Local campaign would certainly be a benefit to the rest of our main core. So much love, after all, deserves to be spread up and down that business district.